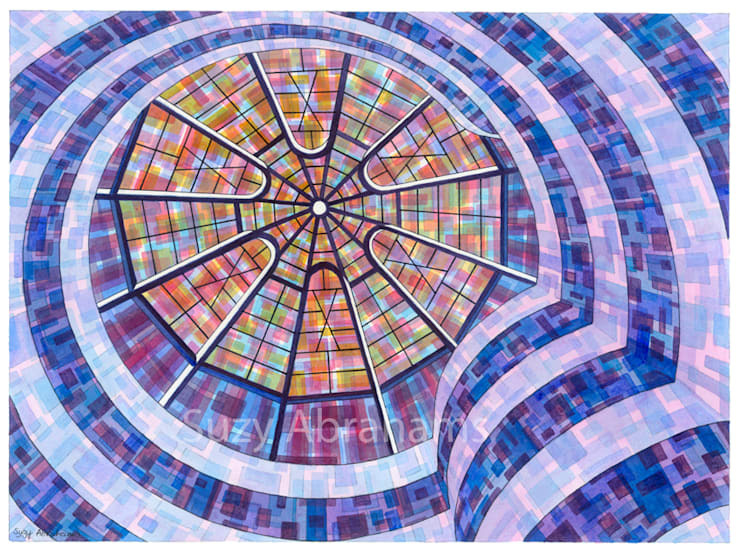 This painting was inspired by museum’s skylight and spiral design of the atrium. The actual gallery is pure white but I have used imaginary colour in the painting. The original acrylic painting is available. Please enquire. Signed limited edition giclee prints are also available in three different sizes’ A2. A3 & A4. Priced £75, £55 & £35 plus postage. The prints include a white border allowing them to be framed on their own or placed in a mount. The prints will fit standard sized frames. Printed on high quality acid free watercolour paper using pigment based archival inks. Superb clarity and high reproductive quality. The original acrylic painting is available. Please enquire. Signed limited edition giclee prints are also available in three different sizes" A2. A3 & A4. The prints include a white border allowing them to be framed on their own or placed in a mount. The prints will fit a standard sized frames. Printed on high quality acid free watercolour paper using pigment based archival inks. Superb clarity and high reproductive quality.